Days at FAME are long. About a week and a half ago I had an especially long day. It started at 7:30AM and ended at 3AM. Our labor ward was full. We admitted a very sick mom and preterm baby who arrived after the mom delivered on her way to FAME. She tried to make it to the hospital for the delivery, but had to stop along the way to give birth. The baby looked to be about 30 weeks gestation and was cold, blue and barely breathing when he arrived. We put him under the warmer immediately and helped him breathe with oxygen and a resuscitation mask. We put in a nasogastric tube and an IV to give him dextrose. He was struggling. We were able to warm him up to normal body temperature and keep his blood sugar up. In the meantime we also admitted his mama. We discovered that she had severe pre-eclampsia, explaining her pre-term delivery. It took the teamwork of three nurses and one nurse practitioner to stabilize her. 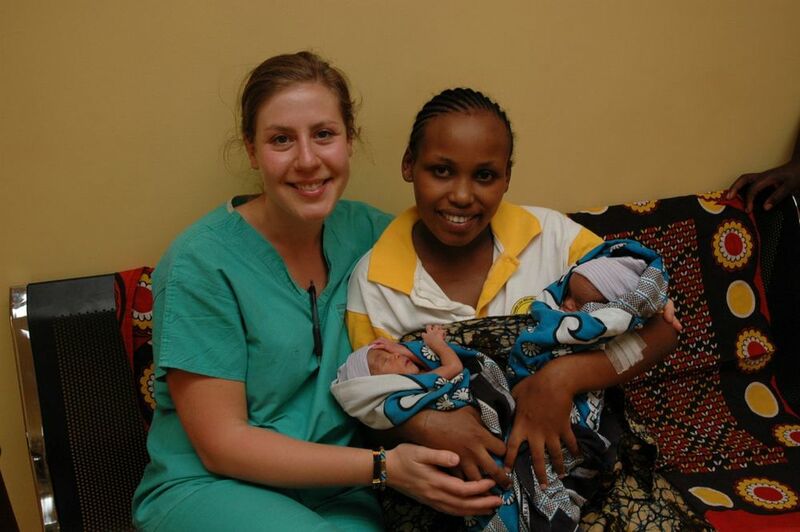 We treated her pre-eclampsia and controlled her blood pressure with a combination of intravenous and oral medications. The other patients on our labor ward included a woman in active labor, a woman with postpartum sepsis and a blood clot in her leg, a woman with a suspected intra-abdominal pregnancy in severe abdominal pain, and another woman with postpartum sepsis who had a C-section at another hospital and had to have a lifesaving hysterectomy at FAME due to severe infection. A very heavy patient load indeed! We were short-staffed on the night shift; Mama Mshana was by herself in the labor ward. The level of care that this group of women required was far too much for one nurse. Safi (our Ward Supervisor) came in to help, and so did I. We rose to the challenge and worked as a cohesive team. At 11 PM we got an admission. Our on call doctor came into the ward with another preterm baby. The mother of the baby had delivered a month earlier at another hospital. The baby looked to be about 28 weeks gestation. They kept the baby in an incubator at the other hospital for a week, and then the incubator broke so they sent mom and baby home. For 3 weeks, the mother did her best to keep her baby alive, finally recognizing she could not do it alone. This little baby boy was skin and bones. He was barely breathing and gray. We all thought that the chances for survival were low. We warmed him and supplied oxygen, and then we waited. To all of our surprise, he made it through the night! What a resilient little one. The next day we started intravenous dextrose to maintain his blood sugar and continued our supportive care. He was fighting to survive and we would give him every chance possible. The first preterm baby boy mentioned was in severe respiratory distress throughout the night. Mama Mshana knew that he and his mother would need one nurse assigned to care for them both. She was already caring for the young woman in active labor, so she asked me to stay in their room to provide 1:1 care. I held the baby’s hand and stroked his head when he cried. It was painful on every level to watch him struggle so vigorously to breathe. I wished I could breathe for him to relieve his suffering. He passed away the following night. We supported him physically and with love until he took his last labored breath. Another nurse, Julieth, had come to our aid at 11 30 PM and so did Kelley, our Women’s Health NP. Between the four of us we were able to provide safe and quality care to all of the patients on the labor ward. In addition to caring for our two preterm infants, we welcomed a healthy baby boy into the world when our laboring mama gave birth at 2 30 AM. This night was another amazing example of the teamwork that happens at FAME. As exponential growth continues, more nurses are being hired to safely staff the two inpatient wards at FAME. Finding experienced nurses is no easy task. According to WHO statistics, Tanzania has 24 nurses/midwives for every 100,000 people. By comparison, the United States has 981 nurses/midwives for every 100,000 people. The miracle of this very busy night is our 28-week baby who is defying all odds. He is gaining weight, eating expressed breast milk by mouth, crying loudly, and spending time out of the incubator on his mama’s chest for kangaroo care. He has astonished us all, and I feel blessed to be part of the team caring for him. We may not have all of the advanced technology available in the more developed world, but the nurses and doctors at FAME are moving small mountains in the care they are providing. I'm not talking about the near blinding lights and deafening cheers that signal Friday night high school football in the USA but rather the spot-lights in the Operating Room at FAME. Lights that bring just as much adrenaline and excitement, along with possibly even greater significance and life changing results. You see, we've spent three of the past four Friday nights performing life-saving cesarean deliveries. FAME opened its doors for Reproductive and Child Health, including a Labor and Delivery ward on the first of October. Since then we have saved six lives with the ability to perform emergency cesarean sections; something far too many women do not have access to in rural Tanzania. On Friday, October 10, a woman arrived to see me in clinic, 15 days overdue with her first baby. At first, she simply said she wanted an ultrasound to see when her baby was due. But as I have learned while providing medical care in Tanzania for the past two months, you rarely get the full story upfront. The patients are strong and resilient and they don't want to worry or burden their doctors. It often takes quite a bit of questioning to get down to the real problem. In this case, the baby initially appeared active and full term on ultrasound, but there was virtually no fluid surrounding him. This young mother-to-be also had high blood pressure and protein in her urine, indicating pre-eclampsia, a potentially dangerous condition for mom and baby that can only be cured by delivering the infant and removing the placenta. The patient was admitted and soon the baby was showing signs of distress. FAME's head doctor/surgeon, Dr. Mshana, and I made the decision to go for a cesarean section. This would be the first cesarean section ever performed at FAME. The patient was frightened, and rightfully so as surgery can be risky business in Tanzania. As Mama Mshana, one of FAME's extremely talented nurse midwives, consoled her, the patient revealed the full story as to why she had travelled several hours from her home in Ngorogoro to be seen at FAME. Shortly after sunrise that morning, she was walking near her home and was charged by a Cape Buffalo. These massive animals can be quite dangerous and aggressive. As this terrified young woman ran for her life and the life of her baby, she fell twice, landing on her swollen pregnant belly. This trauma provided even more of a reason for an overdue baby, lacking enough amniotic fluid, to be in distress. At this point, the patient was rushed into FAME's operating room, which is remarkably well equipped. You'd almost believe that outside of those OR doors you'd find a large, well funded, stocked and supplied hospital in California or New York or Boston, and not a small, rural hospital in Tanzania. Dr. Mshana, an amazing doctor and surgeon with decades of experience, performed the operation with my assistance and the assistance of his wife, Mama Mshana, who acted as our scrub nurse. We were tremendously fortunate to have both FAME anesthesiologists, Sehewa and Doctor Frank, at our disposal along with Siana, the head nurse, Chana, a nurse volunteer from Washington DC, and Dr. Doug, a volunteer pediatrician from Philadelphia. Under the glowing OR lights, on a beautiful Friday evening, this young woman had the very first cesarean section at FAME. Dr. Mshana and Mama Mshana worked as a well oiled machine; you'd never know it had been a few years since they'd last performed a cesarean section. This patient was complicated. She'd suffered a trauma on top of being pre-eclamptic; her baby was 15 days overdue and surrounded by almost no fluid, covered in meconium and clearly in distress. After delivering the infant, a baby boy, we noted that the placenta had abrupted, starting to separate from the wall of the uterus and soon the patient was hemorrhaging. Due to the talented and dedicated staff at FAME, along with the availability of necessary supplies and equipment, this young mother and her baby boy survived. FAME is an amazingly special place, that provides tremendous care to all of its patients and saves lives on a daily basis. I can't think of a place I'd rather spend my Friday nights than under the OR lights in the operating room at FAME. It was such an amazing experience to take part in that I've decided to repeat it twice more on the past two Friday nights. I think if I keep this up, attracting the high risk Obstetric patients for cesarean sections every Friday night the staff here just might kick me out. Three beautiful babies brought into the world so far at FAME Medical. The second and third were emergency C-sections. Two have been discharged and one is recovering well in the ward right now. Lots of joy around here.